Some of the best memories of my childhood are the great swings that we made. My dad started this journey by hanging a rope on a huge pine tree that grew on a steep hill across the street. That led to a childhood filled with adventures searching for perfect trees to hang a rope and a series of bigger and better swings that provided many thrills, danger, and great memories. As a parent, I want my kids to have the share in the same experiences. The only difference is a healthy respect for safety and the importance of managing the risk of a big swing. With small children we started with a small swing over a creek that provided a good thrill and a few wet afternoons falling into the creek. 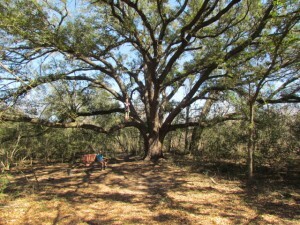 We graduated to bigger swings and have ended up with this great swing on an absolutely gorgeous live oak in the middle of the forest. It is our secret place that is about a quarter-mile hike into the woods. We have spent many hours together hanging out and swinging with friends. If you are up for a little adventure, grab a rope, find a good tree and build some memories that you will share with your family for a lifetime. This entry was posted in Camp Applegate, Family Adventures, Family Vision, Mission, Core Values and tagged camp applegate, Christian family websites, family activities, Family adventures, family memories, family outings, good to great families, Jeff Applegate, rope swing. Bookmark the permalink.